Eighteen-year-old Denis Shapovalov cracked the top 50 this week, becoming the youngest player to do so since an 18-year-old Rafael Nadal in 2004. 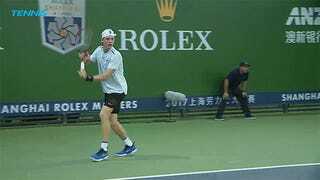 Congrats to Shapo. Shapovalov would go on to lose that match 6-7 (3) 6-3, 6-0, but deserves all my respect for attempting not one but two Air Shapo shots in a single rally, and then smugly looking over the crowd to make sure they were appreciating the show.